The film WHEN SUN MEETS MOON (MAU YUT MAU YUET) already opened on May 31st. Viewers who saw it right away reflected that they wanted more. The 95 minute long film went straight through as each frame of film was director Benny Lau Wai Heng's blood, swear and tears. "For the pace to be even faster and more intense, I was forced to cut some scenes that I deeply loved. Here I strongly ask for the DVD to collect these valuable scenes anew as Easter eggs for fans." The first removed scene to be shown as a rare "action scene" in the film -- when Daichi Harashima and his father Jackie Lui Chung Yin went at it. Director Lau recalled, "Both actors were very serious, Daichi took five slaps from Lui Chung Yin!" Daichi Harashima admitted that this father and son fight scene was an extremely difficult challenge. "I not only had to keep an eye on the action and expressions, but also the lines. Luckily Lui Chung Yin was very accommodating to me and taught me how to take the marks and deliver the lines; everyone contributed to the film. If we fake fought it wouldn't have that feeling. I remember 5 or 6 bad takes, from the numerous lines as well as me being too nervous. I originally pushed Papa away only after he slapped me, I already pushed him away before he even hit me!" 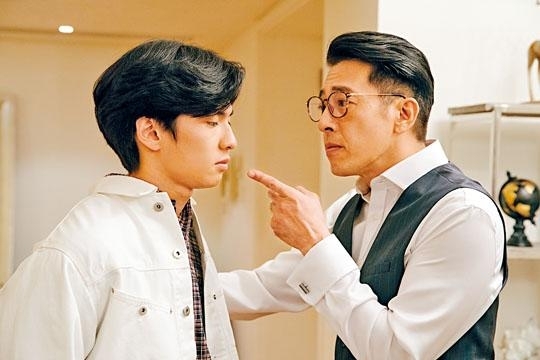 Although Lui Chung Yin already held back, Daichi was still hurting from being slapped. After applying ice he was fine. In real life did Daichi have any memorable experience of his parents getting physical? "Guys mostly would be a little more mischievous, but Papa really spoils me. He never hit me. Mama in comparison is stricter, occasionally she would yell at me." Lui Chung Yin remembered that from rehearsal to the shoot he indeed slapped Daichi five times. "If we really fought, Daichi of course would be no match for me. This scene was jus a push and a slap, not trading punches and kicks. Not every slap was real either. At first I held back, he was a little frightened and wanted to dodge. The director wasn't too pleased. Later we went a little more seriously and his face was all red." Did he have to coax his baby boy? Lui Chung Yin said, "No need, he's a guy. He needs to experience everything. He is so big, he probably won't cry!"